Hotham Inlet, also known as Kobuk Lake, is an arm of Kotzebue Sound on the northwestern coast of the U.S. state of Alaska. It is 50 miles (80 km) long and 5–20 miles (8–32 km) wide. The inlet is the outlet of the Kobuk and Selawik Rivers and it is bounded on the southwest by the Baldwin Peninsula. 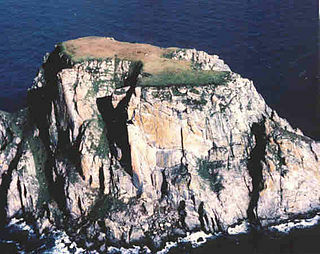 Fairway Rock is a small islet in the Bering Strait, located southeast of the Diomede Islands and west of Alaska's Cape Prince of Wales. It has an area of 0.3 km2 (0.12 mi2). Known to Eskimo natives of the Bering Strait region in prehistory, Fairway was documented by James Cook in 1778 and named by Frederick Beechey in 1826. Although uninhabited, the island is a nesting site for seabirds — most notably the least and crested auklet — which prompt egg-collecting visits from local indigenous peoples. The United States Navy placed radioisotope thermoelectric generator-powered environmental monitoring equipment on the island from the 1960s through the 1990s. HMS Griper was a Bold-class gun-brig of the British Royal Navy, built in 1813 by Mark Williams and John Davidson at Hythe. She participated in the 1819 expedition to the Arctic led by William Parry, made a voyage to Greenland and Norway in 1823, and took part in Parry's third expedition in 1824 as a support ship. Her crew in 1819, 1823, or 1824, qualified for the "Arctic Medal", which the Admiralty issued in 1857. She was eventually broken up in 1868.